Straight, No Chaser: Do You Have Moles? Odds are you do, but we’re not talking about the animal variety. It’s Melanoma/Skin Cancer Detection and Prevention Month, and so if you do have moles, you should know when to be concerned. Let’s review some basic and critical information you should know. 1. What are moles? The term common mole is applied to hyperpigmented skin growths. Typically, colors are pink, tan or brown. They tend not to grow beyond the size of a pencil eraser and are usually oval or round. Moles are most commonly seen above in the waist in sun-exposed areas. 2. Do moles develop more commonly as you age? Hopefully not in your case. Moles develop until approximately age 40, then they tend to fade away. However, ongoing sun exposure at any age can prompt the development of more moles. Still, the growth or changing of moles with age must be a prompt to you to get evaluated. 3. How many moles would be considered normal? Most people with moles have between 10-40. Those with more than 50 have an increased risk of developing melanoma, which is a form of skin cancer. It is important to note that most moles do not turn into melanoma. 4. What are abnormal moles? The medical term for an abnormal mole is a dysplastic nevus. This term refers to moles that tend to be larger with possibly different colors, borders and texture. 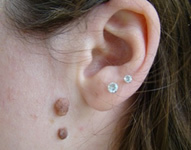 The relevance of these moles is that they are more likely to develop into melanomas, although most do not. The color of the mole changes. The mole gets smaller or bigger. The mole changes in shape, texture or height. The mole starts to itch. The mole bleeds or oozes. A: The mole of melanoma tends to be asymmetric (as opposed to round or oval). B: The mole of melanoma has irregular borders. C: The color of melanotic moles is uneven, and may include multiple colored shades. D: Most melanomas are larger than six millimeters wide (i.e., larger than the diameter of a pencil eraser). E: The mole has been evolving over a matter of weeks or months. Excessive exposure to UV radiation: Our greatest exposure to UV radiation is sunlight. Also, tanning (e.g., use of tanning booths and sunlamps before age 30), an increased lifetime sun exposure and having had at least one blistering sunburn (especially during adulthood), a past history or a family history of melanoma all increase the chance of developing melanoma. 7. How can the risks of moles becoming melanoma be reduced? The best way to prevent the development of skin cancer is to limit your time in the sun. When in the sun, you should use sunscreen and wear clothing that covers your skin. We recommend that you be mindful, not only of the existence of moles, but of other matters that affect your health. Feel free to ask your SMA personal healthcare assistant any questions you have on this or any medical or healthcare topic.